On a team bursting at the seam with interesting hockey journeys, veteran Canadian defenceman Chris Lee has travelled a truly unique path to Olympic Winter Games. On a team bursting at the seam with interesting hockey journeys, veteran Canadian defenceman Chris Lee has travelled a unique path to Olympic Winter Games in Pyeongchang, South Korea. Nobody on this Canadian men's team had to begin his post-junior career by playing Division III college hockey in the United States, like Lee had to when after four seasons of tier II hockey with three different teams he settled for an athletic scholarship at State University of New York at Potsdam (SUNY). Nobody on this Canadian men's team thought their hockey career was finished after four years of college and a degree in business administration until a friend and teammate (Joel Jennings) begged his equipment manager Dad (John 'Biggie' Jennings) to see if he could land Lee a tryout with the Florida Everblades of the East Coast Hockey League. 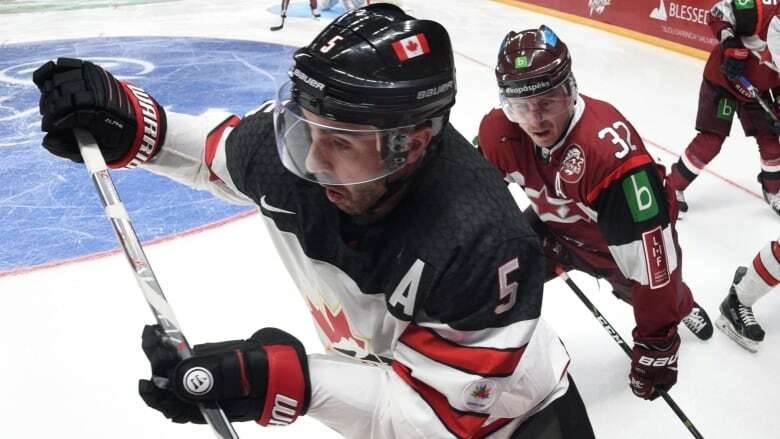 Nobody on this Canadian men's team made their debut for Canada at a world championship at the ripe old age of 36, like Lee did in Paris, last spring. "It's been quite a ride, a great ride," Lee said, named an alternate captain to the men's team on Thursday and part of the six-player leadership group along with captain Chris Kelly, Derek Roy, Andrew Ebbett, Maxim Noreau and Rene Bourque. "I never had this in mind. I never thought I'd have a career in hockey. But I've been fortunate to get opportunities and make the most of those opportunities. I've also been lucky that I've been able to stay healthy." Lee is humble about his achievements and his stick-to-itiveness. But here he is, not only the eldest on the Canadian Olympic team at 37 (born 39 days before Kelly) but one of only two players who hasn't played a shift in the NHL. The other is his defence partner Mat Robinson. But if you tally up all the pro games Lee has suited up for since he left SUNY, he has played a combined 989 outings in five leagues for 11 different teams, including Canada. Lee came close to playing the NHL, twice. When he was with Wilkes-Barre/Scranton, the parent club, the Pittsburgh Penguins, summoned him to the show on Nov. 19, 2009, in Ottawa. Pittsburgh defenceman Mark Eaton was suffering from back spasms. Both Lee and Eaton participated in the pre-game skate, but Eaton was deemed fit enough to play. Lee was returned to the AHL the next day. The second close call was last fall. The Los Angeles Kings invited him to training camp. He could have signed a two-way deal with the Kings, but it was NHL or bust for Lee. If he signed a two-way contract that meant Lee would have been ineligible to play for Canada at the Olympics. "They were good to me," Lee said. "If I was offered a job with another NHL team, [Kings general manager Rob] Blake said he would help in any way he could. They also offered me a spot with Ontario [Reign, the Kings AHL affiliate] on an AHL-only contract so I could remain eligible to play in the Olympics." But the native of MacTier, Ont. waited until a spot opened up with his old team in Russia, Magnitogorsk. Old No. 4 was back. Lee also will wear No. 4 with Canada, a sweater number that is near and dear to him because his uncle is married to Bobby Orr's sister. What's remarkable about his story is Lee has improved with age. After winning two Gagarin Cup championships – the KHL's top prize – in 2013-14 and 2015-16, the latter in which he scored the title-clinching goal, he had his best year yet in 2016-17. He led all KHL defenceman in goals, assists and points with 14 goals, 51 assists and 65 points. He capped off his season with an invitation to the world championship in Paris. Lee was supposed to be a spare part, an extra d-man. But Tyson Barrie was hurt in rough-housing with a teammate back at the hotel. All of a sudden Lee was pressed into action. He played in all seven games and played well in the Canadians silver-medal performance, in which they lost to Sweden in a shootout in the gold-medal final. "No, I don't," was Lee's response if he feels his age. "I feel great. I'm in good physical shape and I take care of myself. I can still skate with the young guys."